From left, Teddy and Maura Sommers, Jessica Evans holding her painting and Grace Sommers. In the late ‘70s and early ‘80s, Sharon Held and her sister Maura, both of whom lived in Mendham, NJ, were regular volunteers at Matheny. Sharon, inspired by her experience at Matheny, went on to become a physical therapist and now lives in the Buffalo area where she is an associate professor at Daemen College in Amherst, NY. 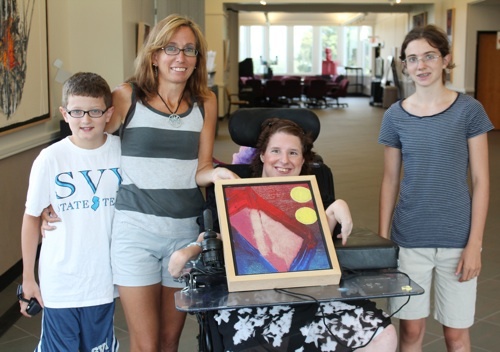 When her sister, now Maura Sommers of Bridgewater, NJ, visited the Arts Access exhibit at the Bernardsville, NJ, Public Library in July, she decided to buy a painting as a special birthday gift for Sharon from her five siblings, parents, nieces and nephews. Sharon’s 50th birthday was July 3. Sommers hopes Sharon will be able to visit Matheny in December when she will be in New Jersey for several days. Arts Access makes it possible for people with disabilities to create fine art, assisted by professional artist-facilitators. This entry was posted in Uncategorized and tagged Arts Access, Jessica Evans, Maura Sommers, Sharon Held. Bookmark the permalink.